A lot of people don’t realize this, but the Pulse app was built as a class project at Stanford University in 2010. 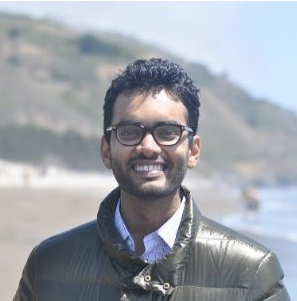 My cofounder, Ankit, and I designed, built and launched the first version of the app on the App Store in 6 short weeks. In the next three years as an independent company, we had an incredible ride, growing the Pulse user base to 30 million users and the team to 25 people. In 2013, as we started thinking about the future of Pulse, we realized that to truly become the authoritative source of daily news, we’d have to get significantly better with our content recommendations. We had done an amazing job giving our users the ability to visually see news from hundreds of sources in one place. But users were increasingly getting lost in this stream of information. Pulse needed to sift through the millions of articles published every day and pick the ones that are essential for each user. In this whole puzzle, we missed one key component: Identity. We knew 30 million users had used the Pulse app, but we didn’t know who they were or who they knew. That is precisely why we joined LinkedIn, the largest professional network. In the past two years, we’ve been hard at work to marry the best content that Pulse has with the deep identity and network data that LinkedIn has, to create the world’s first personalized business news digest. 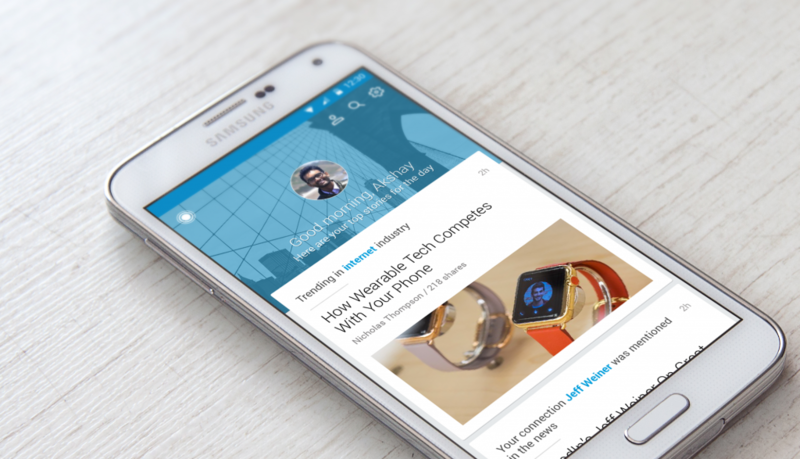 Pulse today powers a lot of content you see on LinkedIn’s homepage feed. Pulse content is also delivered to millions of users every week via the email digest. And perhaps most interestingly, Pulse now has its own organic content. Thanks to the publishing platform, over 130,000 unique original articles are now published every week in the LinkedIn Pulse ecosystem. Through this work, Pulse has emerged as one of the fastest growing products on LinkedIn. 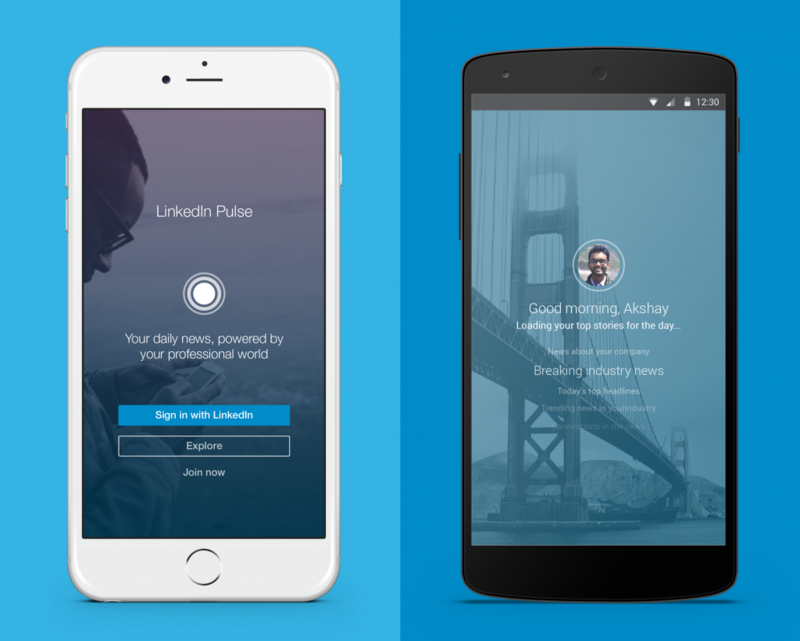 Today, I’m very excited to announce the launch of fully redesigned Pulse mobile apps for iOS and Android. Instead of slapping features on to the old reader app, we decided to completely redesign the new Pulse experience from the ground up. 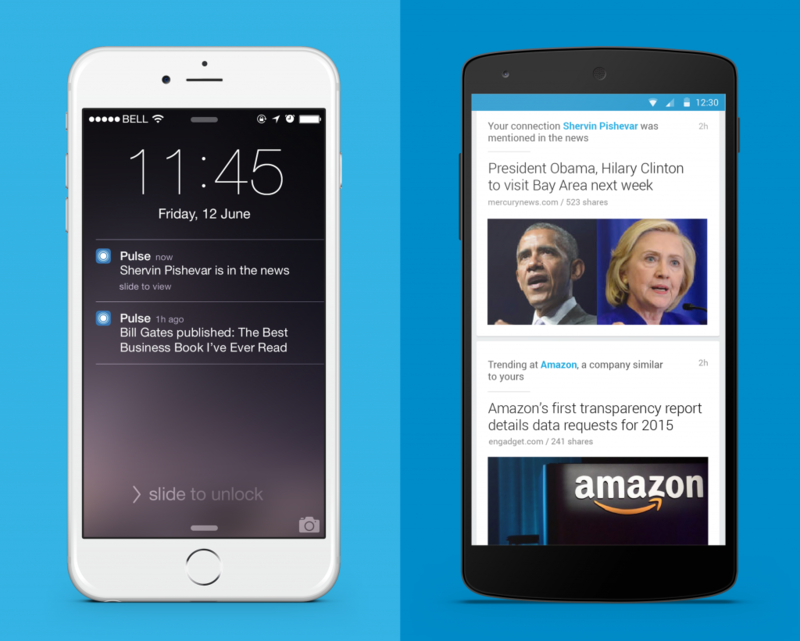 The new Pulse app focuses on delivering you personalized news—news that is powered by your professional world. The first story I see when I log in is a post written by the LinkedIn editor Isabelle Roughol. Her daily post brings me up to speed with all the business news I need to know to get started. Next, the Pulse app knows I work in the Internet industry, so it surfaces a story that is trending in my field. Pulse also know that I currently work as a product manager at LinkedIn —so it recommends a story that’s popular among my fellow coworkers. Next, it alerts me that my connection (and friend) Shervin Pishevar was mentioned in the news. By clicking on that story, I discovered that he’s hosting President Obama and other business leaders at his home this week. (Woah!) Thanks to the Newsle product that LinkedIn acquired last year, I can set up notifications in Pulse so that I get notified every time a connection makes the news. As you can see, without any input on my side, Pulse was able to recommend very relevant, targeted news stories to me, based on my professional identity and my connections. And that’s what we hope to do for 360+ million professionals around the world. The new app, now available on iOS App store and Android play store, will replace the old app in both stores. The old apps will continue working for existing users till the end of year. 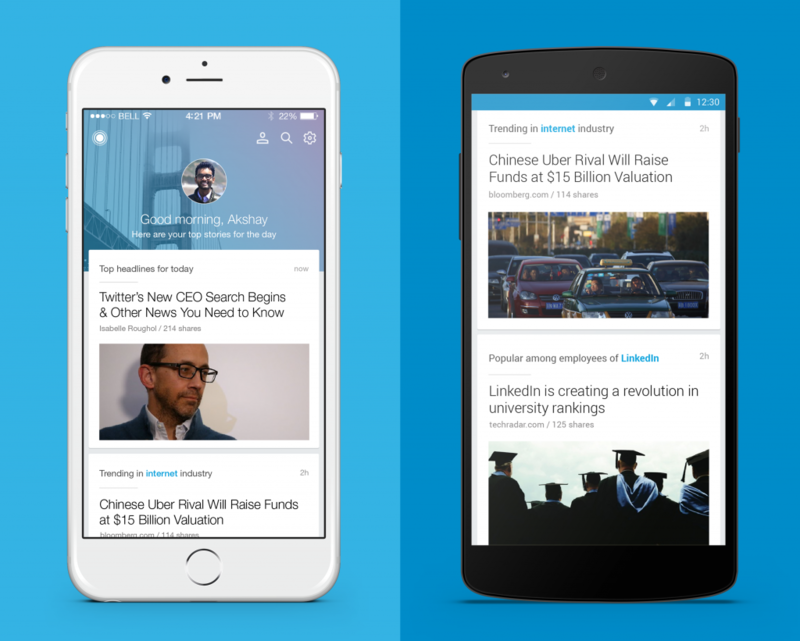 Get ahead of the day with the reimagined Pulse app that is all new and all news. Now you’ll always have something sharp to talk about, every day!